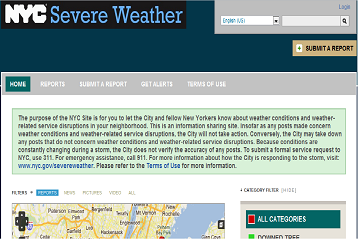 Officials in NYC over the weekend setup a hyperlocal website that allows users to submit damage reports from Hurricane Irene, while various not-for-profits also teamed up to offer the same type of hyperlocal effort for other parts of the East Cost. Users can visit the NYC map which shows reports and photos of damage which includes downed trees and power lines along with road closures and other issues that arose after the storm made it’s way through the city. Hopefully the site will lead to more city offers of this type around the country, allowing residents to quickly update their friends and neighbors about issues in their area.